Taste test: These chips were pretty good, with a decent crunch and a fairly hot, fairly tasty seasoning on them. The taste was similar to the sauce commonly used on hot wings, though it didn't taste like actual hot wings. It left a pleasant, mildly hot lingering aftertaste. 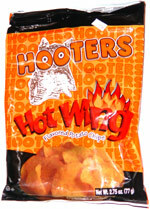 Some of the better Buffalo wing chips (such as Lance's Chip Thunder) really do taste like wings. These didn't match up with the best, but they were not bad. Smell test: Good, smells kind of like hot sauce and remotely like hot wings. This snack was discovered by Colleen at a convenience store on the border of Sherborn and Natick (it's not that bad!). Review published .